We started this ride from Presque Isle, ME at the junction of U.S. 1 and ME 163, near our anchor hotel the Hampton Inn, Presque Isle. Head north on U.S. 1 through Caribou, ME to Saint Leonard and remain on U.S. 1 by turning northwest to Madawaska, ME. This first portion of the loop traverses mostly interior Maine until Saint Leonard. Typical rural two lane road with rolling terrain but nothing in the way of remarkable twisties. After Saint Leonard, leg 2 stays on U.S. 1 as it parallels the Canadian border and the St John river valley. The rolling terrain subsides a little but being in the river valley, the sights remain spectacular. It would be a wonderful side trip to accept the invitation of the two bridges in Saint Leonard or Madawaska to cross the river and experience the Canadian side of the river. (Passport required for entry into both countries.) Traffic picks up a little the closer you get to Madawaska, as civilization starts up again there, although briefly (small town, but the largest up there for miles around). Be sure to stop at the Four Corners Monument on Main street just past the Bridge Street into Canada. 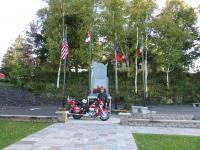 This monument is funded solely by donations from dedicated moto travelers and supporters. It is a very well designed park complete with portable toilets and a souvenir outlet. The park is open 24 hours, but check the hours for the souvenir stand. Madawaska is also a great place to fuel up and eat; plenty of options along the main street. Also, you might want to save time to visit the Harley Davidson store a couple of blocks west of the Four Corners monument. After Madawaska, remain on U.S. 1 west and southwest bound, which continues to parallel the St John river, until Ft Kent, ME. U.S. 1 actually terminates its long 2376 mile journey from Key West, Florida right after passing through Ft Kent. Leg 3 of this loop begins in Ft Kent and goes south on Maine highway 11 through forested country side punctuated with rolling hills, colorful foliage and thinning traffic. What traffic there is, however, includes rather large, fast moving timber trucks. Logging is definitely the economic horse in this area. Route 11 passes by Eagle Lake and Portage Lake, both of which are surrounded by what look like stunning summer vacation homes. The whole 48 miles south to Ashland, ME is a pleasing, rolling delight. Leg 4, the home stretch: at Ashland turn east on ME 163 for the 20 mile ride back to Presque Isle and the hotel. We finished this leg after sunset and we throttled back and used the high beams to give us the most time to stop if wildlife on the road became an obstacle. Moose warning signs along the entire loop were plentiful. Although we didn't see any all day, the prospect of a night encounter was not desired. Night riders beware. During our trip, the colorful fall foliage was just starting to appear and the colors added tremendously to our viewing pleasure. After Saint Leonard, U.S. 1 parallels the Canadian border and the St John river valley. The scenery in both Maine and looking across the river into Canada was absolutely fabulous. The forested hills with the fall colors starting on both sides of the river/border was a never-ending ride of rural quietness. ME 11 from Kent, ME southward, was most definitely our favorite part of this loop ride. The scenery and the sparse population contributed to the enjoyable, solitary "one with the road" feeling. We left Ft Kent just prior to sunset and the falling sun bouncing off the high cirrus clouds produced very impressive colors. We stopped at the side of the road on probably every hilltop to take pictures of them. After riding through Vermont and New Hampshire to get to this part of Maine, it seems the roads on this loop were of similar quality from the same reasons. A full 60% of the road miles had patches on the two tire track areas from the four wheelers. The extreme weather conditions year 'round also take a toll creating frost heaves similar to speed bumps in the mall parking lots. The overwhelming culprit of the less than desirable road quality, however, is probably the tremendous quantity of heavily laden logging trucks abusing the pavement. That said, the roads were not dangerous and only "uncomfortable" in limited, sporadic locations. The overall quantity of sweeping curves, rolling hills and terrific scenery more than made up for the lack of smooth pavement. Due to the rural nature of this part of Maine, the creature comforts are also limited. During the peak summer season there might be more options for food and fuel. In October those establishments were plentiful and available in Presque Isle, Caribou, and Madawaska. We made the whole 150 mile loop on one 6 gallon tank of our touring HD. I highly recommend, however, a food and fuel stop in Madawaska if for no other reason than to stop and savor the flavor of the French-Acadian-American culture. We will return to this part of Maine again. So many other back roads to explore and the solitude beckons to see what's around the next curve in the road. Next time, however, we will travel a little earlier in the late summer season.